Pastor Gilbert Bogolo in front of the ruins of his church in Bangui which was destroyed by Séléka militants four years ago. Four years ago on Tuesday, an eruption of violence in the capital of the Central African Republic, Bangui, left dozens dead and shattered the lives of many others. An attempt by Anti-Balaka (“anti-machete”) vigilantes to oust rebel leader Michel Djotodia, who had swept across the country into the capital to proclaim himself president, led to a violent counter-offensive by Djotodia’s militants, known as Séléka. Pastors Jean-Eric Vogbia and Gilbert Bogolo were among the Christians who lived in PK5, a predominantly Muslim neighbourhood of Bangui, at the time. On the day of the attack – December 5 2013 – they became the prime targets of Séléka militants. 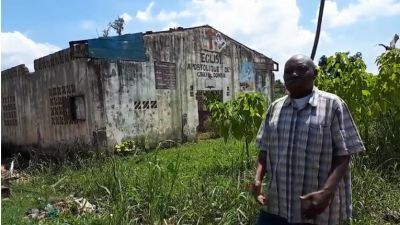 Pastor Vogbia lost his eldest son; they both lost their churches and properties. Four years on, the scars of that dramatic day are still fresh. It was still dark when the first rifle shots and grenade explosions erupted in the heavily populated area of PK5. Many were still in bed, including Pastor Vogbia and his family. At about 4am, as the detonations intensified and got closer, his wife, children and other relatives fled the family compound – a set of three to four residences, inherited from parents. Vogbia and his brother were left behind in the compound, but also decided to flee as the situation became uncertain. 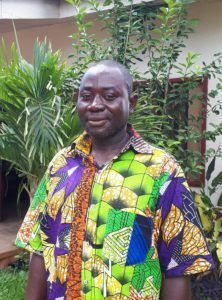 Vogbia’s eldest son – a second-year medical student – was at the university and knew nothing about the situation at home. Vogbia and his family were devastated. Since then, his wife has developed trauma-related reactions. Until December 5 2013, Gilbert Bogolo was the pastor of a church that hosted more than 500 worshippers each Sunday. He also used to work for a petroleum company, and was well-off. “We were terrified by the detonations of automatic weapons,” he recalls. “My family and I stayed indoors the whole day, praying and waiting for the situation to calm. As I looked over the fence, I saw Séléka militants shooting randomly at people passing by. Even animals were not spared. The next day, as the shootings lessened, Bogolo and his family fled to the Mpoko camp near the airport, where thousands sought refuge. The living conditions in the camp were appalling, says Bogolo. People were exposed to the elements, such as the heat of the sun, torrential rain, combined with mosquitoes. There weren’t enough toilets or drinking water to accommodate everyone. Food aid distributions often turned into mass brawls between the internally displaced people (IDPs). Moreover, Anti-Balaka militants were active within the camp. Bogolo describes their three months as a “humiliating experience”; his wife and their ten children were left with nothing to sleep on but some pieces of cardboard boxes. Bogolo and his family eventually left the camp, and moved to a rented house. Four years later, Vogbia and Bogolo have no hard feelings. They say they want to move on. “What happened was a punitive act because of my Muslim background,” Vogbia says. “They wanted to silence the preacher who converts Muslims to Christianity. “It was also an attempt to chase us away from our ancestral lands. Many have already sold their properties (in PK5) and left for other areas of the city. 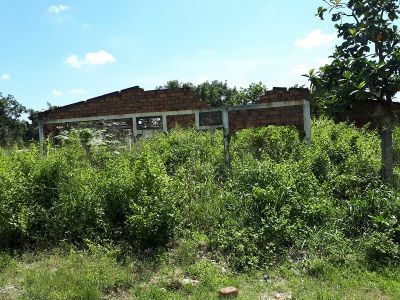 Pastor Gilbert Bogolo’s ruined house. His church now gathers in a tent erected in the back yard of a church member’s house, who generously offered the space to the church. The church has bought a new plot of land and is planning to build another church building. Pastors Vogbia and Bogolo say there is an extremist ideology which fuels the violence among communities, irrespective of their religious background, and that many have been dragged into that way of thinking. Vogbia and Bogolo have pledged to work hard to regain trust between Christian and Muslim communities by promoting dialogue. Yet despite the prevailing calm, they both agree that it’s too soon to think about moving home to their PK5 neighbourhood. Last month, on 11 November, seven people were killed after an attack on a concert organised by young Christians and Muslims to aid reconciliation between the two communities. The attack has raised the fear of a new wave of violence and prompted many traders to close their shops, and some residents to flee to other areas of the capital.